A number of narrators talk of how there always been a struggle over land, sometimes with other communities or the old landowners, but mostly the confrontation has been with the mining companies, whether private or state. "[We have fought] a bit with the community of Yurahuanca yes.also with Rancas. [But] it's ancient history now, something our grandfathers remember. All the communities want to live peacefully and we strive for this. But there is a history of defending our lands and confrontation against the company - and that won't change. Every time somebody comes wanting to take something from us, we've united, just like against Centromin. We've lost quite enough with all the waste and pollution but we go on fighting" (Peru 7). Those that have protested over the mining talk of lawyers 'disappearing' and intimidation, and at times such confrontation has led to violence and death. There is also some reference to the activities of Sendero Luminoso (Shining Path), the Maoist guerrilla movement active in Peru during the 1980's and early '90's. A military base was established in the area to protect people against the "terrorists", though several believe that their true role was to protect the mining companies from protest. Some union activists fighting both for land compensation and better working conditions, were accused of being Senderista (followers of Sendero Luminoso), even though they said they felt as threatened by Sendero Luminoso as by the military. The latter would "barge into the [mining] camps. For them, everyone was a Shining Path member.the union leaders were the greatest suspects" (Peru 17). As one said: ".the truth is we, the workers, were between two fires, between the paramilitary and the Shining Path" (Peru 21). "[The massacre of Malpaso?] Well, the people who worked around there decided to protest about the ill-treatment they got from the gringo [mining] company so they went on strike, I think it was one of the first strikes. They were fiercely repressed and when they resisted the massacre ensued. Several died and those that weren't killed were fired. That's what happened to my grandfather and he had to leave." "[In] 1960, a major problem erupted with Cerro de Pasco Mining Company in Rancas because the estate had expanded so much that there was no land left for the community. When the community set out to recover their land and clashed with the ex civil guard. three members of the community [were] dead. The company expanded by building fences, enormous fences, around the land they thought was theirs. Our people could no longer move freely as they had done in the past and if some unfortunate animal crossed over, the estate people would take it as theirs and cut its throat. That's what brought about the Rancas uprising which ended the way I told you." "Threats would arrive every moment, either from the company [or] Shining Path. We had even become used to get anonymous threats that would tell us that "at any moment we would disappear..." .But instead of being cowardly or running away we worked even harder with the Support Committee to the Federation, with the Metallurgical Union." 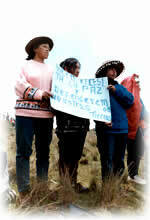 ".we began to co-ordinate with the idea of forming a steering committee for all the mining women in Centromín. We did this because all the leaders began to receive threats, there were disappearances and murders. That was both from Sendero Luminoso and the paramilitaries. That's when the Centromín wide organisation was founded, when they began to kill the compañeros from Cerro de Pasco and they killed a leader from Morococha called Cajachahua. That's when we began to organise around self-defence and human rights." "They took me away from my community accusing me of terrorism, and for twelve years I was persecuted. And I didn't have anything to do with [Sendero Luminoso], apart from the fact that I used to talk to them when they came to this area. I effectively told them that what they were doing wasn't feasible, but that here.the first level of organisation is the stomach, [then] production, organisation and scientific education." "When we started the communal cooperative of Quiulacocha, I think that was in 1970. we had a battle with the campesina community of Yanahuanca and they took away 1000 metres of our land. But.we didn't want to become rivals with any other community, because we know we are working together and we are united as comuneros and as campesinos. What I would like to do, señor, is make an appeal to all the powers that be in the government, that they support all campesina communities equally, because we are brothers, we can't fight with anybody, señor."